Your garage door does more than provide a lockable place to keep your car (or those boxes of holiday decorations, for some of us!) and keep out the elements. It’s a focal point of your home’s design, its curb appeal. If you’ve decided it’s time for a garage door makeover, a good place to start is learning about the styles and types of garage doors available. Here is a handy guide from Elite Door Systems. Many DIY stores suggest the first step of garage door replacement is measuring the height, width and thickness of your current garage door. You don’t have to do this when you work with Elite Door Systems. We’ll do it for you when you call us for a free quote. We pride ourselves on our flexible appointment schedule and do our best to meet your scheduling needs. One of our highly trained, professional representatives will inspect your current garage door and sit down with you to discuss your options for a new one. This is a great time to let your creativity out to play. 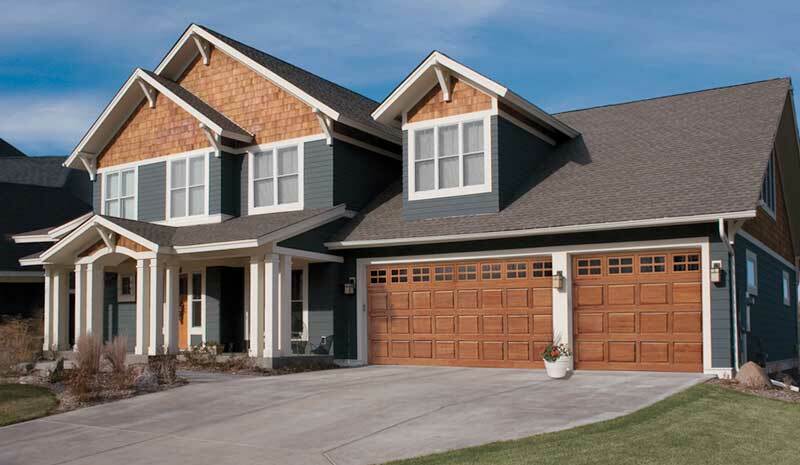 Find a garage door style that works with your home, both in design and color. If your home’s exterior is ultra-modern, for example, you probably don’t want an Old World Carriage House garage door. You can even add window panels, as well as exploring color options to personalize your design. This panel design works best for homes with a traditional exterior. Carriage house panels bring an Old World charm to raised panels. Depending on the color and window type, flush panels can be used for just about any home. These are flat panels with a slight texture that can be made to compliment and almost blend into the walls. This choice provides a level of depth to your garage door with a beveled look to each panel. Long raised panels are distinct and eye-catching, but still add to your home’s curb appeal. Just like long raised panels, you get the appearance of depth with this choice. Short raised panels are great choices for homes with intricate, detailed trim such as Victorians, colonial-style homes with a focus on symmetry or Tudors with their strong architectural lines. Choosing a design is the beginning. Now, you need to select the garage door type that works best for your garage door system needs, as well as your aesthetic plan. These doors come in a variety of wood species and can be either stain or paint grade. You can choose the Old World Carriage House design or raised panels with a more modern feel. Real wood doors can sometimes be expensive, but there are budget-friendly options. Faux wood doors are constructed of fiberglass or steel with a fake wood finish. There’s nothing fake about the charm and sophistication found in this look, though. The most economical option is the single-layer garage door. This type is created from a single sheet of galvanized steel. Double-layer garage doors are constructed of a galvanized steel skin over a thick polyurethane or polystyrene backer. You get soundproofing and insulating benefits from this choice. The strongest, most soundproof and secure choice is the triple-layer garage door. These are built like the double-layer option but with the addition of another galvanized steel skin on the side facing your garage’s interior. You can also get thicker insulation in this type. Elite Door Systems also offers a wide variety of hardware, such as hinges, handles and simulated windows to further enhance your garage door design. You can even paint them for a more customized appearance. We also offer a wide variety of automation products (openers, sensors, etc.) from which to choose.